- Long Island Jewish Health System. • A new 563-seat elementary school at the Foundling Hospital at 17th Street and 6th Avenue. • Thousands of new jobs and a boost to the local small businesses. 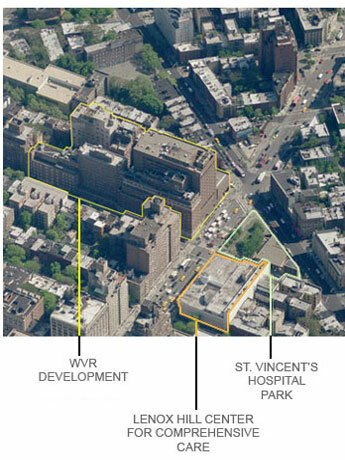 and adaptively reused, that reduce bulk and enhance the Greenwich Village Historic District. • The creation of the 16,000 sq ft St. Vincent's hospital neighborhood park, designed in collaboration with community input. Design elements will be included that will honor the rich history of St. Vincent's 160 years of service, in addition, 1,600 sq. ft.
will be dedicated for an AIDS memorial. • This project is seeking to become the first LEED Neighborhood Development project in New York City. We look forward to working closely to make sure that this project is a success and something we can all be proud of for generations.